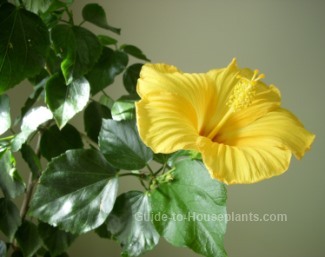 Did you know you can grow exotic Hawaiian flowers indoors? Unlike cut flowers, these tropical bloomers have staying power. And why grow just one? Mix and match these exotic plants for a stunning range of color, texture and even height. Combine a few and you'll enjoy an eye-catching botanical haven in your home. Need some inspiration? Here to "coax you into bloom" are a few of my favorites. An island favorite, the plumeria tree is magnificent. Its branches are covered with big clusters of wonderfully fragrant flowers. Those colorful and captivating blooms are used to make flower leis in Hawaii. 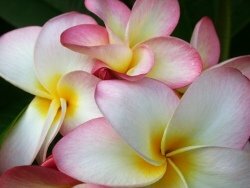 Give your plumeria plenty of warmth, sunlight and humidity and you'll enjoy its blooms all summer and fall. You'll want to give this glorious flowering tree some room to grow, too. Even planted in a pot, you can expect plumeria tree to reach several feet tall. A greenhouse or sunroom may be the ideal spot for it. 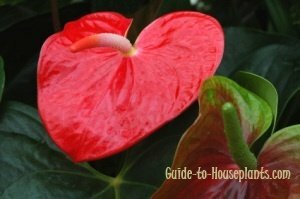 Among the best-known exotic Hawaiian flowers is anthurium (shown at right). Also known as Tail Flower, this exotic beauty features long-lasting red spathes and lush, deep-green foliage. 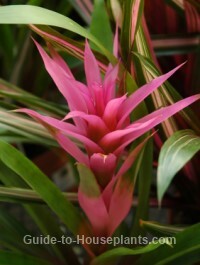 If you're unable to locate these plants locally, you can order tropical flowers online. Flower delivery for orchid plants, anthurium, hibiscus and other Hawaiian tropical flowers is a fast and easy way to grow your collection. Not to be missed are the big, ruffled blooms of the hibiscus flower (shown at left). This shrubby plant bears a succession of flowers throughout summer when given enough sunlight. You'll see hibiscus all over these tropical islands. This is the state flower of Hawaii. No tropical plant collection is complete without a Bromeliad. Those vibrant, rosette-shaped bracts last for months...then produce offsets, which can be propagated for more plants. This genus makes up about 2,000 species, among the best known and grown is the scarlet star (pictured here). Among this clan is the pineapple plant. Pineapples are a major agricultural crop in Hawaii. It's easy to grow your own little plant in a pot and enjoy this exotic bromeliad at home.